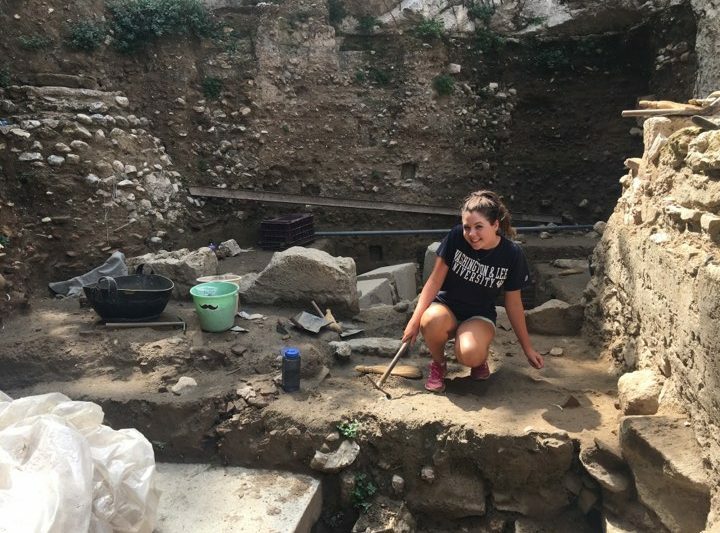 A Classical Career While digging at the Athenian Agora Excavation in Greece this summer, Allison Schuster '19 indulged her passion for archaeology and classics. 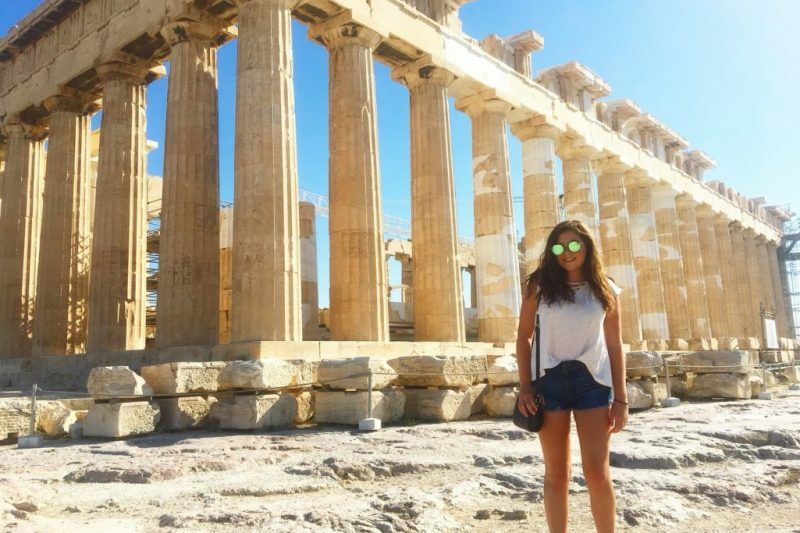 Allison Schuster ’19 in Greece, where she spent the summer working on the Athenian Agora Excavations. What is the Athenian Agora Excavations program? The American School of Classical Studies at Athens has been excavating the area of the Ancient Agora since 1931. 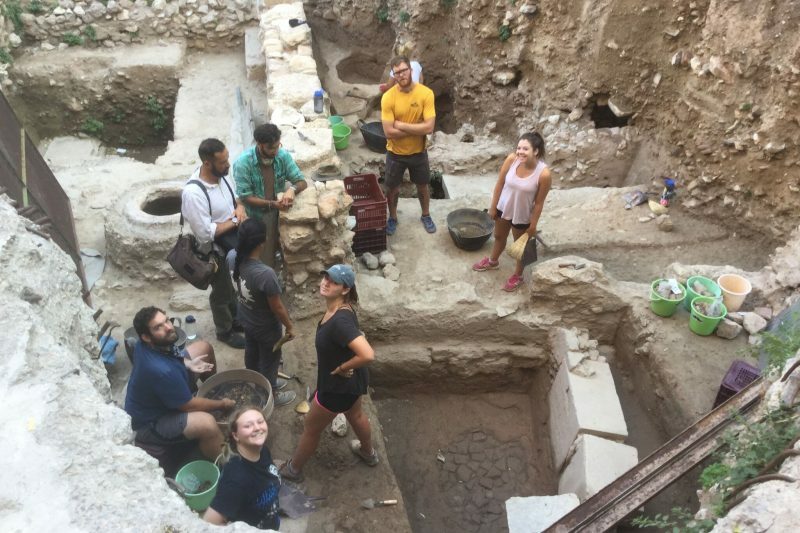 The excavation team of professors, graduate students, undergrads and other classical archaeologists working on the excavations have been able to excavate nearly every public building known to have been in the Ancient Agora. There are three other W&L students at the same program: Skylar Prichard ’19, Emily Cleveland ’19, and Ariana Jepsen ’19. 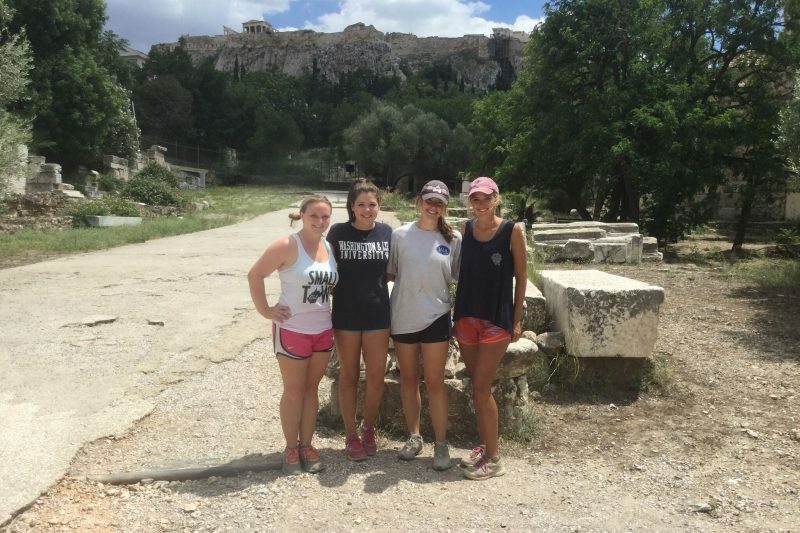 Four W&L students worked on the Agora excavations this summer: (L-R), Skylar Prichard ’19, Allison Schuster ’19, Ariana Jepsen ’19 and Emily Cleveland ’19. Tell us more about what an archaeological dig site looks like. The site of the Athenian Agora is located directly in the center of Athens, just off the northwest slope of the Acropolis. The dig is comprised of four trenches through which the diggers rotate every two weeks, and all of the trenches are working in different time periods from Byzantine house ruins to Neolithic tombs. Excavations in my current trench are focused on uncovering the Ποικίλη Στοά (“Painted Stoa”), a public building of the 5th Century BCE. Other excavations this season include Mycenaean burials, the northern portion of the Panathenaic Way, and a late Roman mansion; these ruins span over two millennia. How did you find out about this program and why did you get involved in it? Professor Michael Laughy in the Classics and Archaeology departments has been involved in the Athenian Agora dig for over 20 years. He first introduced the idea to me and encouraged me to apply, so I definitely would not be here today if not for him! I’m super lucky to have found a place that gives me the opportunity to hone skills in both archaeology and classics, and put my knowledge of Ancient Greek to use in a way that I wouldn’t have been able to find anywhere else. 7 a.m.: The local church bell rings, I’m already in the trench ready to dig. 11 a.m.: Lunch bell rings, spring out of the trench to the Stoa of Attalos to grab my lunch and sit outside to eat for about 20 minutes. Back in the trench by the 11:30 a.m. bell. 1 p.m.: Water break; if we’ve found an inscription, the trench supervisors provide ice cream! 2 p.m.: When the 2 o’clock bell rings, work is done! We typically go for gelato, a walk around the city, or to a lecture on pottery, sculpture, epigraphy, osteology, etc. The rest of the afternoon is free for the diggers. Usually that means home to rest before thinking about expending any more energy. Occasionally, we all get together for pizza, drinks and socializing. This trench was opened as an experiment to see how Agora artifacts extended eastward. What has been your favorite experience so far living in Athens? Getting to travel to all of the ancient sites around Greece has been super cool, but visiting U.S. Ambassador Geoffrey Pyatt’s house for a pool party was also so fun. Has it been challenging in any way? The biggest challenge has been adjusting to life in Athens; no city I’ve been to can really compare to the lifestyle and politics here. The unrest among citizens and the general hatred for their government has been really eye-opening for me. Once, when walking out of the metro station, I was consumed by a large crowd protesting the Macedonia name change. As the protesters were tear-gassed to prevent ascent upon the Parliament Building, I was caught in the crowd and tear-gassed. It really makes you realize how much we take political stability for granted in the United States. How has this experience related to your larger professional or personal goals? As a classicist and archaeologist, this is truly the best place to spend the summer. Working with the amazing classicists has helped me explore some of my options post-W&L. Being part of the most well-renowned classical archaeology dig has certainly opened doors to other excavation work or classics pursuits in the future. Allison Schuster ’19 digs in a trench where she found multiple coins. Has your work this summer impacted your future plans in any way? I’ve become aware of many more options that I have for the future, and it’s comforting to have a group of dedicated classicists and archaeologists to tell me about their experiences and advice. I feel more informed and prepared to apply to graduate programs, and have built a network of classicists to call upon anytime. How did W&L prepare you for this experience? The Classics Department at W&L gave me the opportunity to become part of such an exciting and well-renowned program. Without the help and guidance of Professor Laughy, I wouldn’t be able to be here in Athens. His classes in Ancient Greek, Greek Art and Archaeology, and others have prepared me for this program. 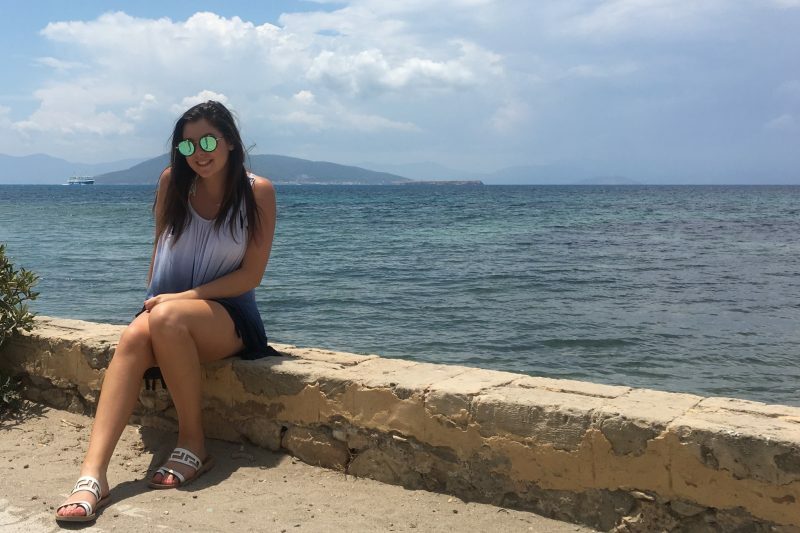 Allison takes a break from archaeology to soak up some sun and scenery in Greece. What extracurricular activities do you do? 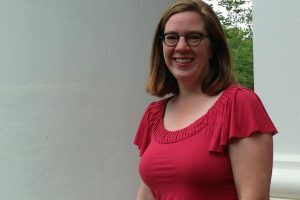 I’ve wanted to study classics since I was in high school, and the Classics Department at W&L has cultivated my passion to an extent that I could never have dreamed. Moreover, along the way I was introduced to archaeology and discovered my passion for it. As I mentioned earlier, Professor Laughy; he truly has been the best. I don’t think I could have discovered my own potential so much without his help. I’m so thankful for the time and effort he has put into my scholarly career, and I am so inspired by his work in classics and archaeology. Favorite place to eat in Lexington? What do you order? Southern Inn; anything on the brunch menu! Freshman year doesn’t define your college experience! The Trojan War with Professor Laughy (I’m clearly a groupie)! MockCon — so, so much fun!